Coach Ali Alamdari is entering his 11th season as the head coach of the Adrian College women’s soccer team. Alamdari’s teams at Adrian have compiled a record of 107-68-25 and he led the program to the first MIAA Conference Championship in school history in 2011, with a record of 17-5. Prior to his arrival, the Bulldog women’s soccer program had just one winning season in its 20 year history. Since Alamdari’s arrival, the women’s soccer program has produced 1 NSCAA All-American, 11 NSCAA All-Region Honorees, 4 MIAA Most Valuable Players, 17 All-MIAA First Team Honorees, 11 All-MIAA Second Team Honorees, and 30 MIAA Players of the Week. Coach Alamdari is Adrian's career leader in wins and win percentage, and is licensed by the USSF and NSCAA. He holds a Master of Arts degree in Performance Driven Leadership from Western Michigan University. Coach Marti Corby comes to Adrian after an illustrious playing career at Grand Valley State University, where she led the Lakers to three straight NCAA DII National Championships from 2013-2015. She was a four-time All-American and was twice named National Player of the Year. Her stellar play also earned her an invite to the United States Under-23 Women's National Team training camp in 2016. After the completion of her Bachelor's degree in Clinical Exercise Science, Corby then joined Grand Rapids FC for their inaugural season in 2017. 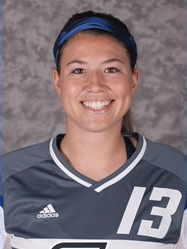 She picked up where she left off at GVSU, scoring the game-tying goal in the UWS National Championship match before going on to win in overtime.